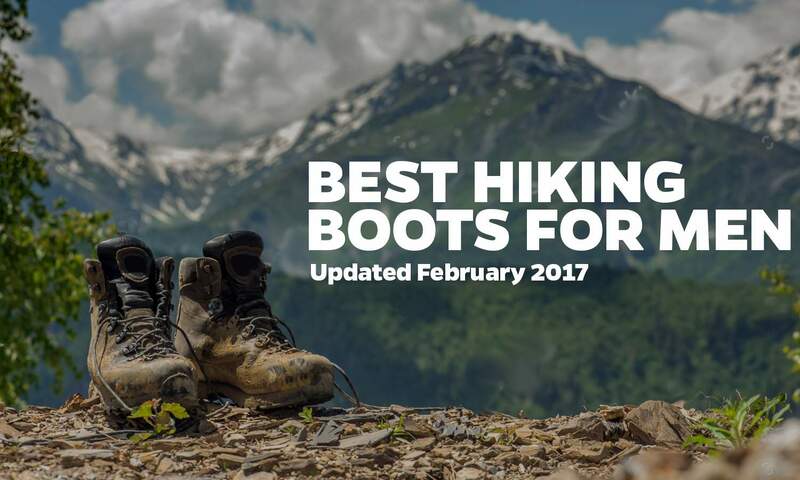 The year 2017 is upon us and if you’re wondering what are the best hiking boots for men this year we’ve got a whole new ranking of the best models that are on the market. We’ve had an updated version of the review of the best hiking boots for men in the past 2015 and 2016 and now it’s time to round up the top hiking shoes for men in 2017. Our overall reviewing style has not changed significantly in the past 3 years since the first review we had three years ago, but we’ve decided to summarize the method we use to get to the best model for the current year. To get to the bottom of the million dollar question (or in this case more like 120-150 dollar question), we climbed mountains and trekked through river beds putting these hiking boots to the ultimate test. All of the boots included in our 2017 review were tested for more than 70 hours each and have been put through all types of weather conditions, from dry desert terrains to muddy mountain tops that test how well their seems and soles respond to humidity and water. Each pair of boots has been tested thoroughly by an experienced hiking enthusiast first and an amateur that has no idea how protect or keep the boots from getting worn out fast. Although we didn’t succeed in getting any of these boots ripped apart, we did get an overall idea of which ones are tougher and are able to take a beating and which ones are not going to last as long. Truth be told, all of the boots included here are pretty durable and won’t disappoint you even if you are really into hiking and trekking and go on more than 30 hiking trips a year, so keep on reading and find out which are the best models we tested this year. Pros Doesn’t require too much break in and is pretty much ready for a long trekking experience the second time you put them on. Sturdy, with great traction and feel really solid and offers plenty of support. Best bang for the buck. 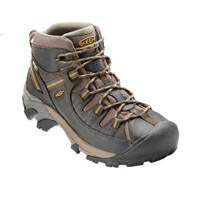 Solid hiking boots from a solid manufacturer, these hiking boots will offer plenty of comfort. Lightweight and ready to get you where you want to go. Fantastic durable boots that will provide a ton of support. These boots by Vasque might not seen like the logical choice because to most people because of their weight, but they will be the top choice for heavy backpackers. Comfortable, offering plenty of support these boots will likely be enjoyed by lots of people around the world. They are lightweight for the support and durability you get and there aren’t many downsides to owning them aside the price . Fantastic in the winter these durable boots will likely be the popular choice of people that aren’t trying to save money and are serious about their hiking gear. Lots of traction and all the ankle support you might want. Cons As with all Teva models, the straps are a bit of a problem as they could irritate the skin when they rub on it for a while. Not so great durability, break in period is longer, but that’s most of it. Not the best possible design, these definitely lose lots of points in the design department, also the traction isn’t quite good. Again, bad straps that could cause for blisters if the sandals are worn all day. The lack of Arch support is also noticeable compared the other models. Almost no traction on some surfaces, no arch support here either and the durability could be significantly improved. Your feet are what gets you up and down those hills and brings you to breathtaking views. The boots you have are the armor that keeps your feet safe from all of nature’s traps and tricks that will get in your way. If you do not own a pair of trekking boots that can do at least the following things, you’ll have an unpleasant time in the mountain, especially if you’re there for more than a few hours at a time. First off, your hiking boots need to keep your feet comfortable during all times and especially when you’re cruising along, as that’s what you’ll be doing most of the time anyway. Second, the best hiking boots for men will keep a man’s feet dry. Although not every hiking trip includes going through muddy or wet conditions, or will take you through a river or a lake, there are plenty of locations which will require such footwear. Keeping your feet dry will prevent you from getting blisters. Water tends to get the grease of the skin washed away, which leads to more friction between the inner linen of the boots and your skin, which ends up hurting a lot. Keeping your ankles stable and safe. This is really important because a sprained ankle will immobilize you easily and you’ll end up having something far from a “bonding experince with nature” and if that’s the first time you’re hitting the hiking trail, it might be your last one. We all know how important first impressions are and if your first impression of hiking is to sprain your ankle, well, you won’t try it a second time. Ankle collars on hiking boots also have the mission to protect your ankle astragalus and everybody knows how bad it hurts when you hit that part of your foot. Get you there without falling apart. Regular shoes and running boots might be perfect for running on a rubberized track or get you from point A to point B walking on paved sufraces, but most of the trails you’ll see in nature won’t be either rubberized or paved, so the only thing you can count on is a rugged, tough rubber sole. In most cases hiking boots use the Vibram outsole technology which offers not only protection to the rest of the shoes, but serious traction and traction could mean the difference between a pleasant hike and an injured foot. There are three main types of male hiking boots and the main difference between them is how much they weigh. That’s obviously not the only thing that sets them apart as their weight is determined by the materials used in the manufacturing process and said materials could mean that a pair of boots is waterproof or not, whether it’s made out of leather or not, etc. In this we decided to list the three types of men’s hiking boots from the heaviest ones used for heavy backpacking to the lightweight models that are best suited for day-packing. There are plenty of options from this category to choose from. Although we haven’t reviewed all of the models on this page, we decided to list the top rated models in 2017 that we were able to find and give you a couple of links to the ones that we have had the option to test. Heavy backpacking boots are best suited for long backpacking trips when you will need the extra ankle and foot support to be able to handle the extra weight of your gear. Such boots are often called heavy hikers and another feature that you could expect from such models is a better water resistance, overall better durability and in some instances a lower comfort level. The sweet-spot for everyone who goes on different trips in terms of length, type of terrain and uses a different amount of gear on every adventure. The mid-weight category obviously includes models that weight less then heavyweight ones. This so called sweet spot means that you get the best of both worlds – great foot support, great traction, good amounts of durability and plenty of comfort. Hiking Gear Guru’s top pick for men’s mid-weight hiking boots in 2017 the Salomon Quest 4D 2 GTX, which is accidentally the overall best model we tested for the year. Daypacking is a trend that has been established in the past 10 to 15 years as something people would do as a cardiovascular exercise and is basically a hiking trip that lasts no more than a full day. The only things that people who go daypacking bring are the bare essentials such as a reasonable amount of water a first aid kit and the most lightweight hiking boots a man can buy. In this occasion these are the Keen Targhee II Mid which is not only the most lightweight pair of the ones in our top 5, but it is the one most sensitive in terms of pricing. The Keen Targhee II MId is a fantastic choice if the fast everyday life just doesn’t allow you to spend more than a day in the mountain or hitting the hiking trails and would not have to bring along a ton of gear with you. We are truthfully impressed with this Keen model and it’s price to features value which is above the average on this list. 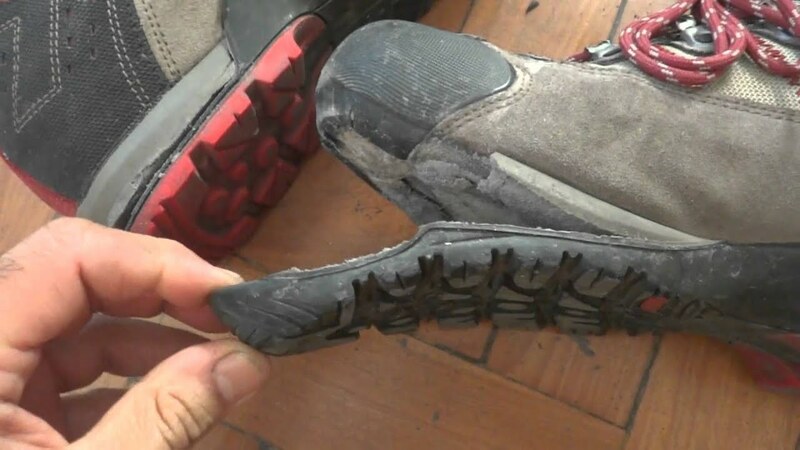 Lightweight backpacking boots are often used by men for other activities that do not require a ton of ankle support for your feet for example, but in some instances their water resistance might be compromised and that’s why not all lightweight men’s hiking boots are going to work as an everyday pair of footwear if you live in snowy conditions or a place where it rains a lot. This is not the case with the Keen Targhee II Mid as it provides plenty of water resistance and although the model does not utilize the Gore-Tex technology it’s still a formidable pair of footwear that will keep your feet reasonably dry even if it’s pouring rain. There are in fact many different types of men’s hiking boots and their features vary from one another as the conditions in which you could go hiking. There are dry and hot desert like places which offer amazing scenery and on the other side of the spectrum there are the wet, cold and in some instances snowy conditions where a pair of hiking boots with better traction, which offer better stability are simply a must have. Most hiking boots reviewed here have a Vibram sole which offers great traction and although there’s actually a newer Vibram composition that’s just around the corner now. These soles are called the Vibram Arctic Grip and they offer something unique that will soon change the world of boots in general. You wouldn’t really need the Arctic Grip if you’re in a desert though, but a good ventilating system is a must have or you’ll feet will sweat and blisters will simply tear you down. That’s why we decided to tell you about each model on the review list with as many specifics as possible, covering everything from traction and comfort all the way to general durability and water resistance. All of the models that you saw at the top of the page, also known as our top 5 are boots that offer a lot of everything and will offer the most value for the money you’ll spend. Hiking boots aren’t usually really cheap and you will definitely like to get the most out of your money. For the average man a pair of hiking boots lasts approximately 3-4 years with light to moderate usage and although there are many models that will surpass this average lifespan, there are some models such as the Asolo TPS 520 GV that will lose the sole in just a matter of weeks. The last time this model was updated was back in 2015, but we’re expecting that Solomon will bring out a fresh model, if not this year, then certainly next year. The reality is that Salomon has been in this game for quite some time now and they are simply one of the best brands out there when it comes to outdoor equipment and the Salomon Quest 4D 2 GTX is pretty much the epiphany of all of the experience and information the company has gathered throughout the years about hiking boot design, durability, comfort, traction and all the other trades of a great pair of hiking boots. We have an in-depth review of the Salomon Quest 4D 2 GTX and we won’t go into too much detail about this particular model here, but we will add some valuable information about the different aspects of these trekking shoes. The traction of this Salomon boots is simply unbelievable and using these shoes to climb steep hills or get down from ’em is a breeze. Some experienced people that love going of trails or simply climbing more extreme trails will definitely love the extra traction that these add to your performance. They provide a feeling of safety, which is important no matter if you are an experienced mountain climber or a person that’s on his first hike. Even moderate hiking trails have some steeper parts and we believe that with the help of the Salomon Quest 4D 2 GTX you’ll feel a lot better as slipping on rocks with these is near impossible. Better yet, the model will provide you great traction on other types of surfaces as well. Sandy desert trails or muddy hills covered with moss will be easily conquered with the help of this Solomon model and they will be conquered with style and comfort. That brings us to another part of our summary about the Quest 4D 2 GTX which is comfort. One of the most important things about a pair of hiking boots is the comfort and the support it provides. Fortunately for everyone that has decided to buy this particular model there’s plenty of both offered here as Salomon have gone above and beyond to make sure that you get a ton of ankle support (which is really important if you’re a novice), but that doesn’t compromise the comfort you feel. The slightly higher heel part of the boots might feel weird the first time you put these on, but after about a mile in them, you’ll feel like that’s the perfect position for your foot. The lacing system of these boots is also something that we should note as it has been designed to accommodate both narrower and wider feet. Somehow Salomon have been able to hit two birds with one stone here as the special lacing system. The way it works is that the lower part of the boots is quite flexible and the laces down there can help stretch out or narrow the forefoot part. If this was 20 years ago, we probably wouldn’t believe that a hiking boot can be equally good for people with narrow and flat feet, but the Salomon Quest 4D 2 GTX is definitely one of the best hiking boots for narrow feet and wide feet out there. A great combination of firm, but pretty soft materials used for the collar of these boots helps get a really stable pair with the aforementioned tons of ankle support. Aside from the materials the collar itself sits pretty high up and that is one of the reasons why the ankle support is so great. Salomon have also been able to strike a perfect combination of a firm forefoot that helps you balance well and get the weight of the boots just right. There isn’t another model that comes even close in terms of stability to weight ration similar to the one of the Salomon Quest 4D 2 GTX so that’s another feature of these boots that we loved a lot. The other thing that this model impressed us with is the fact that although there are a lot of different materials used in the manufacturing process, the boots offer great breathability that not many of it’s competitors at this price point can match, especially in a combination with perfect traction and great overall comfort, so here’s a little more about the boots’ breathability. So far we’ve concluded that these Salomon boots are fantastic in each of the different aspects that we covered. Would it surprise you that in terms of breathability they are probably the best product in the mid-weight hiking boot division. Well if it does surprise you, it probably shouldn’t as we already told you that those are the best overall hiking boots money can buy, but if it doesn’t surprise you then you have already done the research and know that nylon mesh panels combined with the GORE-TEX liner allow your feet to breathe without being exposed to any dirt, dust or even water. If you are not familiar with the term Gore-Tex, in short that’s a waterproof breathable fabric, but we won’t be going into details about it and you can learn more about Gore-Tex here. It’s safe to say that Salomon are one of the best companies when it comes to highly breathable hiking boots and as usual their latest model is no exception. So is there anything that these boots aren’t good at, it seems to me that they are just fantastic in every way. Well there are a couple of downsides and one of them is that they weight quite a bit. That obviously brings us to the next part of the summary of this model which covers exactly that. If you like lightweight hiking boots, then you probably already know that these aren’t going to be your boots. There’s a trade off when you want something that has tons of features and in this case that’s the weight of the boots. They weight approximately three and a half pounds a pair or for our friends over in Canada or Europe that’s about one and a half kilograms a pair. This is quite a heavy pair of boots by all standards, but as we already said, there’s no way boots that offer such an extraordinary grip, comfort that are also waterproof would weight less than that, at least not in these day in age. For what it’s worth these are lots of lightweight models of hiking boots out there and there are a couple of them here on this review, but the Salomon Quest 4D 2 GTX simply isn’t one of them and weight is the one thing that it’s not that great at. Here are a quick summary on what these boots are best for. With all this grip and traction alongside the fantastic comfort and ankle support these boots are best used for heavy backpacking trips and multiple day trekking. You wouldn’t necessarily be wrong to pick this model even if you love fast hiking, but these breathable boots being waterproof and all are best utilized for backpacking in tougher conditions. The weight isn’t a problem, especially when you consider that combined with a proper pair of socks these would go through snow, mud and cold rivers without a problem and that’s a trade you’d happily made if you’ve ever been on such a hiking trip. Keeping your feet warm and dry is one of the most important things you could to and there aren’t many hiking boot models that would do that better then the Salomon Quest 4D 2 GTX. How is this value calculated exactly and what does best value mean in this review. Well value is typically described as – best monetary worth you can get from anything from a service to a product. In this case the price to quality ratio is the best out of the products that we’ve included in or review of the best hiking boots for men in 2017. The overall price of the Keen Targhee II Mid is pretty low and although Keen are well known for their sandals, they have made strides of progress in hiking boots manufacturing to be able to compete with the best brands in the business such as Merrell, Salomon, The North Face, La Sportiva and others. This model can be found online at prices ranging from $130-$140 which is a pretty narrow price difference, but as it seems Keen don’t offer too much of a discount to their retailers and the retailers are not able to offer much of a difference in pricing between each other, but the price of the model is really good as it is, so additional discounts aren’t really necessary. Traction-wise this Keen model is probably the best one the brand has ever produced. It grips well on dry granite and loose gravel as well as dusty trails and surprisingly enough it works quite well on wet, muddy surfaces too. These hiking boots are quite lightweight and they don’t really offer a ton of insulation as heavier models would, but the truth is that these aren’t winter hiking boots. The Keen Targhee II Mid is a great choice for light hiking and day hiking and it’s our top pick for day packing hiking boots because of the versatility, the great comfort and good traction they offer. Durability isn’t the strongest feature of this Keen model but that in no way means that they are going to be easy to destroy or damage for the average consumer. If you’re looking for your first hiking boots, this model by Keen should definitely be on your shortlist. This Keen model is just amazing! The first time one of our associates put them on he compared these hiking boots to his Nike running shoes which says a lot. We all know that the only way a hiking pair of boots feels super comfortable is when you just took your snowboarding or skiing shoes off. Well that’s not the case with the Keen Targhee 2 Mid. There’s a real soft dual insole which feels really comfortable and combined with the soft ankle collar make for a really smooth ride even for longer trail walking. The thing about these Keen boots is that this comfort also has it’s trade off and it is the support you’ll get from them. Being so soft and cushy these boots’ ankle support is compromised because of the soft materials. By no means are these boots unsupportive, but compared to other models they simply aren’t that great. The stability of these boots is great for a pair of lightweight backpacking boots, but they are not the top choice if you’re going on a more severe hiking trail that requires you to balance extra weight in the form of a 60 liter backpack for example. Keen have decided to go another way in offering a breathable and waterproof pair of hiking boots and not the usual nylon mesh and Gore-Tex combination that other brands have used. Their own Keen.Dry fabric is good at offering both and it has obviously helped reduce the cost of these boots considering their price, but it doesn’t reach the Gore-Tex in terms of quality and both breathability and water resistance aren’t as good as it is on the superior Salomon Quest 4D 2 GTX model which is the winner in overall best hiking boots category. 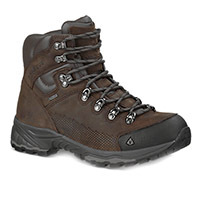 Significantly lighter then most other models you’ll find on this list of the best hiking boots for men in 2017 the Keen Targhee II Mid weights only 2.5 lbs a pair (that’s for a size 11) which in terms of kilograms or grams means just over 1 kilogram for both shoes. That’s about 30% less then most of the other models we’ve got on the list which means that you won’t get tired that fast with them and as mentioned before these would be great for people that aren’t in that great of a form or that have just gotten into hiking and mountaineering. The Keen Targhee II Mid is a perfect choice for a novice hiking enthusiast. They are a fantastic choice for someone that isn’t willing to spend a small fortune, but would like to get comfort and traction that are above average. Beyond average is actually a bit of an understatement for the quality of these boots as they are really good at what they are as your feet will breathe just fine in them and their water resistance although not the best is close in performance to the best boots on the list using Gore-Tex technology. Although we would like to award each and every company for their fantastic efforts and for the great improvements they’ve made to their models in the past 10 years there’s no way that every model could be a winner. That’s why we try to pick the feature of each model of hiking boots that stands out the most and point it out. The Vasque St.Elias GTX are the most comfortable hiking boots for men in 2017 without a doubt. Although we talked a lot about how comfortable the Salomon and Keen models are, they simply don’t offer the quality you get from Vasque’s latest and greatest model. There are a ton of new features that have been implemented in creating this model such as the EVA cushioning pads, the use of Vibram outsoles that generates both grip and protection for your feet at the same time and along with the high quality leather and some synthetic materials used in these boots the final result is astonishing. If you are going on a long hiking trip such or doing something extraordinary such as walking the whole Appalachian Trail for example, there’s no better companion for you then a pair of Vasque St. Elias GTX. Using these boots will guarantee that you go through long hikes with ease and not to forget style. Obviously hiking boots aren’t made to be a fashion statement, but the extra thought that went into designing these boots shows. Waterproof, tough boots with good traction on all surfaces these boots are quite light for what they are. Our associate Leam Greiner the pro that tested the Vasque St. Eliast GTX said that these should be the benchmark for the best hiking boots for men, but the fact that they cost a bit more then the Keen Targhee II Mid left them just under the summit. This left aside the Vasque St. Elias GTX is a great all-rounder and they would be perfect for newbies as well as experienced backpackers and the fact that these are built so light makes them great for both long hikes and shorter day hiking trips. There’s no question about the support of these boots either as they will let you cruise for miles without even thinking about sore feet. Once you break them in you could use these for years to come and when you put their light weight into the equation it’s easy to understand why we’ve selected the Vasque St. Eliast GTX to be a part of our top 3 hiking boots in 2017. Alright we did say that the Keen Targhee II Mid is the perfect pair that would work on every terrain and offers amazing support, but the same could be said for the Vasque St. Elias GTX. The truth is that the real decision between these two should be – which design do you prefer better and are you willing to spend an extra 40-50 dollars to buy the Vasque instead of the Keen model. They are really similar in terms of performance and have really close metrics if you are willing to trust our review. Just like the other two models we’ve reviewed above the Vasque St. Elias GTX will provide it’s owners with good traction on a variety of surfaces from dry loose gravel and granite rocks and boulders through muddy hills all the way down to showy trails and even river waterbeds. There outer sole with Vibram rubber is the perfect thing to keep you steady and safely right on track. Vibram is known to have really great traction, especially on dry surfaces such as rocky hills and granite rocks even when these rocks are planted in the ground at over 30 degrees. The design of these Vasque boots includes a molded midsole along with a midfoot shank that further improve the stability of the boots. The modfoot shank and the that improves the torsional stability of the Vasque St. Elias is well complimented by the cushioning system with EVA insert and you won’t feel hiking mile after mile as an unpleasant job. You are actually more likely to wait for the new views ahead of you which is the essence of a great pair of hiking boots. Once you don’t even think about your feet you know you’ve picked the best option. 10 out of 10 in comfort is something only this model scored on our board. Ankle support is great and all, but if the ankles feel uncomfortable the whole thing seems pointless. Well that’s definitely not the case with this model as they offer a fantastic support and the leather and synthetic materials used to form the ankle collar just WORK! There’s plenty of leather on the outside of the collar to protect your ankles and the collar is flexible just enough so that you can move freely in them. The stability of these boots is more than good, but it’s not the greatest on the list. The Salomon Quest 4D 2 GTX is the better pair if stability is of utmost importance to you, but if you’re backpacking light you won’t need anything more than the stability offered by the Vasque St. Eliast GTX. If you’re a heavier person for example of you simply love longer hiking trips and bringing tons of gear with you, there might be a few other better choices for you down below. Keep reading and you’ll find the hiking boots for men with best stability of all on the market in 2017. High quality leather and a few seems is a prerequisite for boots that feel right at home in shallow water. Just under 6 inches to be precise is the deepest you could go in before water floods in these boots, but that’s the highest ankle collar and the highest waterproof point of all the boots included in this list. These boots will have no problem keeping your feet dry so long as you stay on the shallower parts of a lake or if you’re going through a shallow river up in the mountain. The lack of many seems means that even after a lot of use the possibility of a “hole in the hull” which in other words means that your waterproof hiking boots will stay waterproof. The Vasque St. Elias GTX scores a 9 out of 10 in terms of water resistance and durability wise things aren’t much worse. In fact the durability meter of Hiking Gear Guru shows a 9 out of 10 as well, which makes this Vasque model the most durable hiking boots for men we’ve tested and that’s something that power users should take note of. Durability is a major factor if you’re looking for thousands of miles with the same pair of boots and the Vasque St. Eliast GTX can provide you with such a life-cycle. Once again 3.5 lbs or about 1.5 kg per pair, which is pretty much the standard weight for a pair of proper hiking boots. Considering a pair of Timberland work boots that people use for everyday use weight about 2.5 lbs a pair this isn’t too much. Most of these hiking boots for men are not only packed with features and are manufactured from pretty durable thus heavy materials, but men’s hiking boots are noticeably heavier than female boots, so if you are a female looking for the best male hiking boots in 2017 for a present or something like that, don’t be intimidated by the heavy weight of the ones reviewed here. 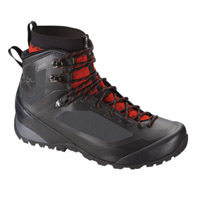 The Vasque St. Elias GTX is a great pair at a really good price. Found almost at all retailers at a price around $199 these men’s hiking boots are a good choice if you are a person that will try many different types of terrains and trails and would go on different types of adventures with it. The St. Eliast offers great qualities in almost all aspects that we review here at the Hiking Gear Guru. 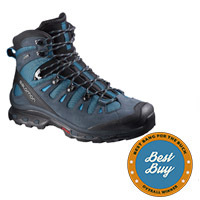 Hitting high marks in most departments these are a perfect choice for anyone who wants a durable pair of hiking boots for men that are always ready to put them in their bag and go anywhere, anytime. These all-rounders are certainly worth being in our top 3 and their overall features score is the same as the one on Keen’s best model of men’s hiking boots. Here’s something you should understand about the Lowa Renegade GTX. This is a model that’s been around for years and although it has received a lot of praise throughout the years the model is now starting to show it’s age. 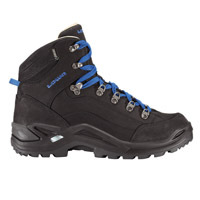 These Lowa hiking boots for men might have received a few updates over the past few seasons, but they are not as close to the top in terms of performance as they used to be a couple of years ago. With all that being said, these boots are not that far from the truth and if the models from Vasque, Keen and Salomon weren’t that fantastic, this Lowa model would have been awarded. The Renegade GTX is comfortable, and tough and it does what a pair of mountaineering boots need to. The model is also waterproof and offers traction, support and protection for your feet even if you go somewhere bringing a ton of gear with you. Water resistance is actually where these boots even outperformed the model from Keen, but unfortunately for Lowa that was the only thing they have managed to do better then their competition and that’s why Lowa Renegade GTX did not get picked as one of our favorite 3 models. There are a couple of other things that are worth mentioning about the best male hiking boots by Lowa in 2017. One of those things is that there are wide and narrow sizes available so almost anyone should be able to get a Renegade GTX pair that will be a proper fit for their feet and considering the overall great comfort that this model provides it’s owners with, this is a great piece of hiking gear to have. The lacing system isn’t the greatest, which may affect the feel of safety, but an easy fix could be applied by purchasing an aftermarket set of laces that works a little better with the hooks on these boots. The boots are a bit lighter then the rest of the mid-weight category, but not considerably. With only 0.5 pounds lighter (about 200 grams) you might not even feel the difference between these and a heavier model like the Salomon 4D GTX 2 or the Keen Targhee II Mid. Traction is good, but nowhere as great as the traction offered by our award winner – the Salomon 4D 2 GTX. The Renegade GTX is does work for all types of terrains – dusty conditions, loose gravel and muddy conditions aren’t going to be a problem in general, but as with any other hiking boots, you would prefer using these in dry conditions as the traction on wet, slippery surfaces is understandably not going to be perfect. As we mentioned already the fit of these boots is pretty good and although the ankle collar isn’t as high as it is on the Vasque GTX or the Salomon 4D 2 GTX. The fit is quite good for the Renegade GTX, but these men’s hiking boots are better then the rest on the list in terms of break-in time. The boots fit quite well and don’t need a lot of breaking in if any at all. It is quite soft in the inside, but as mentioned in the summary for these boots, you might need to replace the standard laces, because the lacing system here hasn’t been thought through well enough. The ankle collar might is a bit short, but the support it offers will be enough for almost everyone that will put these hiking boots through mostly average trails and the support is also good enough for you to comfortably wear backpacks with light to moderate weight. That’s where the Renegade GTX by Lowa stand out. The water resistance also known as waterproof level is the best tested out of all models in the list. Lowa are known to make waterproof models that simply do not let water get in and get your feet wet. They actually have a patent on waterproof seams that you can find more about here. Lowa have been producing waterproof models with really good performance for the past 20 years because of this patent and nowadays combining this technology with the Gore-Tex liner these hiking boots for men are simply impenetrable. Aside from the obvious use as hiking shoes for your next trip in the mountain, these could double up as working boots. They are durable enough to endure everyday use and if you don’t put them to the ultimate test of submerging and walking on extreme terrains in extreme temperatures with them, these boots will work well for you. The comfort is one of the main aspects that these boots benefit from and although they aren’t as good compared to the top models, there are people that prefer the design and feel of these boots to the more secure and more supportive models. The leather used on the Renegade GTX has been known to crack at times so a good leather impregnator would be a good idea, especially if you’ll use them in subzero conditions more often than not. There are a few that we have already covered such as the traction you get, the comfort you feel, the support you’ll receive and of course things such as waterproofing that matter a lot, but there are a few other aspects that we haven’t gone into detail about and we think that they are worth mentioning. Some of them might seem as sub-features of the ones mentioned, but they are worth considering and being covered none the less. The lacing system is a really important aspect or a feature of the boots you’ll be buying. Most hiking boots use a 6 point lacing system, but some models such as the Merrell Targhee II Mid only have 5 such points. In some instances the ankle support or the whole support of the foot might be compromised because of something as simple as the design of the boots. Most manufacturers have adopted the design doesn’t really matter approach and that’s completely understandable as their products will be covered in dust, mud or worse through most of their lives. Some of the models have let us down with the way their laces work and one particular model that disappointed us a lot was the Merrell Targhee II, the laces of which come off or fall off from the upper hooks sometimes when you leave most of your weight to the front of the boots. The solution is as easy as exchanging their original laces with smaller, stiffer ones. That solution worked for us and honestly – if you aren’t pushing this model too hard like we did, you might not even notice this problem. Well we did mention that design is not the thing that most of the manufacturers such as Lowa, Merrell, Salomon or Keen put as a priority when they decide to create a new model of hiking boots especially for men, but that doesn’t mean that the footwear you’ll be wearing looks like it was designed by a two year old. Most of these boots have been made out of genuine leather which doesn’t only work as a waterproof layer, but it doubles up as a fashion statement. Genuine leather definitely looks a lot better then Gore-Tex linen, but the truth is that it might not be as versatile or effective in some instances. That being said, we believe that the Salomon 4D 2 GTX does look like the most futuristic pair of boots to take up the mountain, but if you’re more of a classic kind of guy the Lowa Renegade GTX which is made with lots of leather might be the right pick for you. The design of the Keen Targhee II Mid isn’t anything that you’ll look twice, but believe it or not Keen has a loyal following of men that really love their design style and as the Targhee II Mid doesn’t deviate much from it this model is liked by many. The fit of the boots you’ll be buying is such an important aspect that it accounts for over 80% of the returned shoes and boots bought online according to Chargeback.com. If you are uncomfortable in the boots you’re wearing, you might as well not go hiking at all. Comfort is obviously not the top priority when you’re exploring the great outdoors. That doesn’t mean that you should bereave yourself of one of the few comforts that you are in control of. As most of the people that are visiting this page will probably buy hiking boots online, trying and testing out the models themselves isn’t really an option before ordering, but we have a list of each type of hiking boots for men here as well as a list of the men’s hiking boots which are most true to size. In this case the battle is fought between the Salomon 4D 2 GTX and the Lowa Renegade GTX. Both these are pretty much spot on with their sizing, but the model from Salomon could run a little narrow for people with wider feet. The traction of this (THESE) Salomon boots…. Some experienced people that love going of (OFF) trails…. Salomon have (HAS: subject–the company–is singular) gone above and beyond…. Somehow Salomon have (HAS: subject–the company–is singular) been able to hit two birds with one stone here as (AS to WITH/THROUGH/IN THE FORM OF/BY USING/ETC.) the special lacing system. …there’s no way boots that offer such an extraordinary grip, comfort that are also waterproof would weight (WEIGH) less than that, at least not in these day in age (THIS DAY AND AGE/ or just THESE DAYS). For what it’s worth these are (THERE ARE) lots of lightweight models of hiking boots out there…. …there aren’t many hiking boot models that would do that better THAN the Salomon Quest 4D 2 GTX. There isn’t another model that comes even close in terms of stability to weight ration (RATIO) similar to the one of the Salomon Quest 4D 2 GTX so that’s another feature of these boots that we loved a lot. The other thing that this model impressed us with is the fact that although there are a lot of different materials used in the manufacturing process, the boots offer great breathability that not many of it’s (ITS) competitors at this price point can match…. So is there anything that these boots aren’t good at, (NO COMMA, JUST A QUESTION MARK) it seems to me that they are just fantastic in every way. (SECOND PART IS ITS OWN SENTENCE) Well there are a couple of downsides and one of them is that they weight (WEIGH) quite a bit. Thanks again for the review! I didn’t read the second review. Your author has a vibrant writing style with great detail and relevant coverage. With the exception of a few typos and editorial errors, your publication is VERY readable and captivating!